Gasification of organic waste is a broad applied technology for large-scale waste to energy plants. Since 2004 Terragon Environmental Technologies Inc. has worked on a viable, safe and efficient small-scale solution. This has resulted in waste gasifier MAGS: a device which eliminates organic waste in a safe, clean and very efficient way. Auto – Gasification refers to the re-use of the synthesis gas fraction as fuel for the process itself. In addition, MAGS recovers thermal energy. Marine and Offshore structures are by definition isolated and removed from available infrastructure for long periods. Vessels generate waste from various sources and managing those, in particular the contaminated streams, may raise operational issues, high disposal costs and environmental impact. 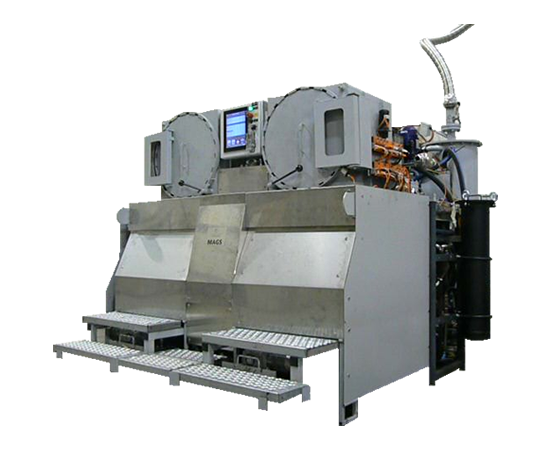 Waste Gasifier MAGS – Micro Auto Gasification System – provides a viable solution to process organic (non) hazardous waste shipboard. The system is based on thermal destruction via gasification with energy recovery, whilst typical waste streams such as: sludge, oily-wastes and contaminated dry waste is used to fuel the system. Another beneficial aspect of MAGS is an integrated exhaust and effluent treatment system to meet the most stringent emission standards.